German growth slowed less than analysts predicted in the second quarter, signaling that the region’s largest economy may be robust enough to handle the fallout from Britain’s decision to leave the European Union. Gross domestic product rose a seasonally-adjusted 0.4 percent in the three months through June, the Federal Statistics Office in Wiesbaden said on Friday. 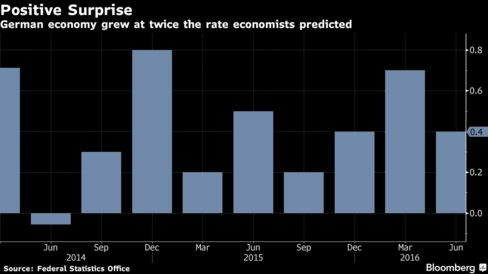 That’s twice the rate forecast in a Bloomberg survey of economists and follows growth of 0.7 percent in the first quarter. The economy expanded 1.8 percent from a year ago. A temporary slowdown had been predicted by the Bundesbank, which is counting on record-low unemployment and rising wages to bolster output over the summer months. Companies from Siemens AG to Evonik Industries AG have struck a positive tone in earnings reports over the past weeks, even though they warned that uncertainty in the aftermath of the U.K.’s June referendum may alter prospects — the country is the third-largest destination for German exports. The euro was little changed after the report and traded at $1.1142 at 8:19 a.m. Frankfurt time. Growth in the April-June period was driven by net trade as exports rose while imports slid, the statistics office said. Private and government consumption also supported the expansion. Equipment and construction investment damped output. Germany is kicking off a busy day of euro-area data, with the Netherlands set to publish its second-quarter GDP estimate at 9:30 a.m., followed half an hour later by Italy, the currency bloc’s third-largest economy. Portugal, Greece, Cyprus and Slovakia will also release figures. In a sign that the recovery in the 19-nation region was modest before the British vote, growth slowed to 0.3 percent in April-June period from 0.6 percent, according to an initial estimate issued July 29. Eurostat is set to confirm that reading at 11 a.m., according to economists surveyed by Bloomberg before the German report. 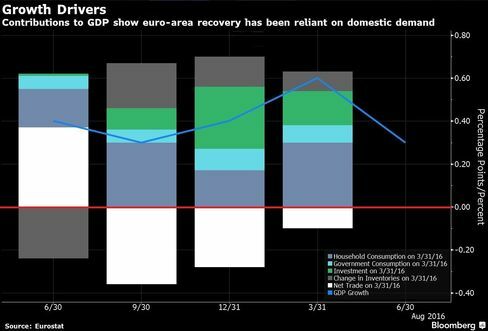 With growth stagnating in France and the Greek economy probably back in recession, Germany’s role in keeping the euro-area recovery on track has risen. Bundesbank President Jens Weidmann has been adamant that his projection of a pickup in the third quarter hasn’t been derailed by the Brexit vote, and corporate Germany agrees. Siemens, Europe’s biggest engineering company, raised its earnings outlook for the second time this year, even as Chief Executive Officer Joe Kaeser warned that political upheaval in countries like the U.K. risks damping orders. Evonik, Germany’s second-largest chemical maker, said 2016 results will be in the upper half of the forecast range despite a “slightly” lower outlook for the U.K. and Europe. European Central Bank President Mario Draghi has said he’s ready to act if a faltering recovery weighs down inflation. The Frankfurt-based central bank is scheduled to set policy on Sept. 8. The Bank of England has already cut rates to a record low in a package of stimulus measures. Still purchasing managers in the euro area surveyed in July reported accelerating output, and a European Commission survey showed economic confidence unexpectedly increased. One reason for optimism may be full order books, which are set to shield manufacturers from potentially dwindling demand for another four months. German consumers are similarly unfazed. Unemployment extended its decline in July, with the jobless rate at the lowest since reunification. A GfK study showed 95 percent of the country’s citizens don’t see their jobs at risk after the U.K. referendum, even though more than half are worried that the economy will suffer.